PepsiCo, Inc. (PEP) manufactures, markets, and sells various foods, snacks, and carbonated and non-carbonated beverages worldwide. The company operates in four divisions: PepsiCo Americas Foods (PAF), PepsiCo Americas Beverages (PAB), PepsiCo Europe, and PepsiCo Asia, Middle East and Africa (AMEA). 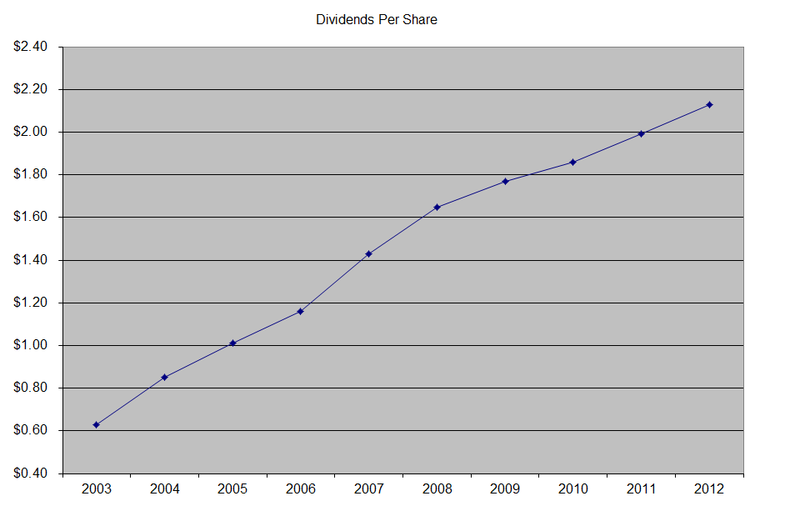 The company is a dividend aristocrat which has increased distributions for 41 years in a row. The most recent dividend increase was in February 2013, when the Board of Directors approved a 5.60% increase in the quarterly dividend to 56.75 cents/share. PepsiCo’s largest competitors include Coca Cola (KO) and Dr Pepper Snapple Group (DPS). The company has managed to deliver an average increase in EPS of 7.40% per year since 2003. Earnings growth has been almost non-existent since 2009 however. Analysts expect PepsiCo to earn $4.39 per share in 2013 and $4.77 per share in 2014. 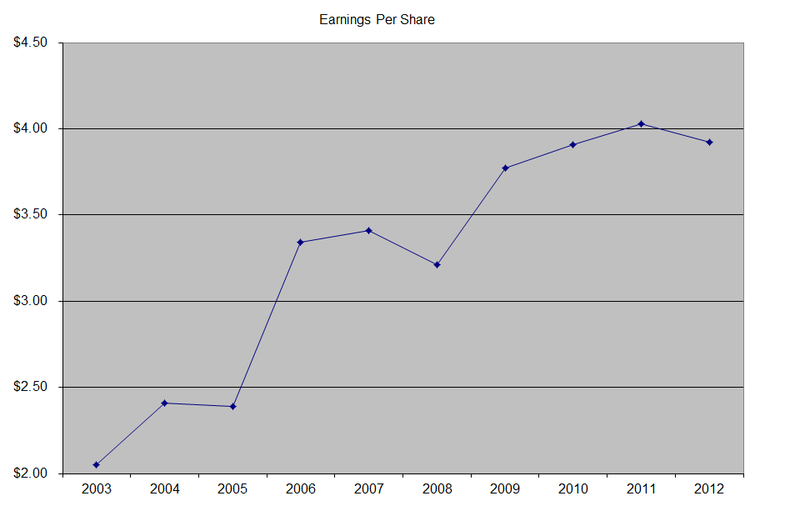 This would be a nice increase from the $3.92/share the company earned in 2012. Over the past decade, PepsiCo has consistently managed to repurchase 1.10% of its outstanding shares every year, on average. PepsiCo is also undergoing a strategic initiative in order to cut costs by $3 billion through 2014. In addition, the company is heavily investing in its brands in North America, by increasing advertising budgets. The company is also increasing prices in its products in order to offset inflation costs. These price hikes could make consumers more resistant to PepsiCo’s products. 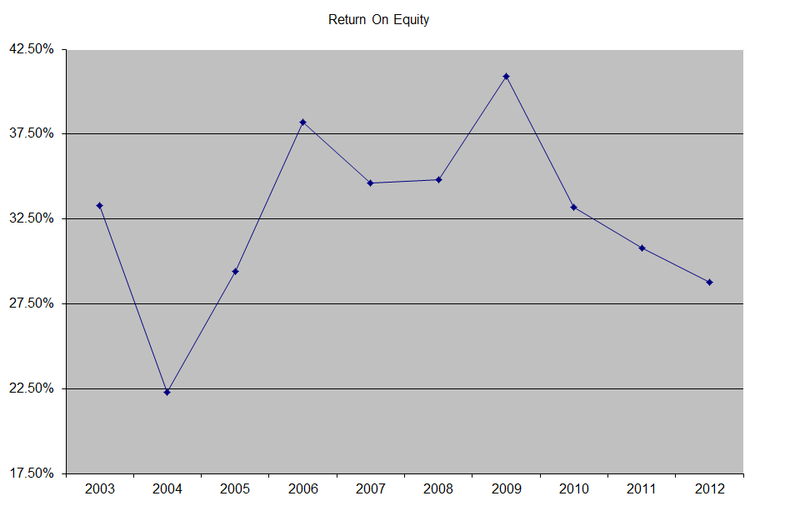 The company has a high return on equity, which has remained above 30%, with the exception of a brief decrease in 2005 and 2012. Rather than focus on absolute values for this indicator, I generally want to see at least a stable return on equity over time. The annual dividend payment has increased by 13.60% per year since 2002. A 14% growth in distributions translates into the dividend payment doubling every five years. If we look at historical data, going as far back as 1965, we see that PepsiCo has actually managed to double its dividend every five years on average. Dividend growth has slowed down over the past few years, mostly due to flat earnings since the end of the financial crisis. Over the past decade the dividend payout ratio has increased from 30% in 2003 to 54% in 2012.. A lower payout is always a plus, since it leaves room for consistent dividend growth minimizing the impact of short-term fluctuations in earnings. Currently, PepsiCo is fully valued at 20.70 times earnings, yields 2.70% and has a sustainable dividend payout. In comparison Coca Cola (KO) yields 2.70% and trades at a P/E of 20.90.